How often do you go to Google and type in your name, your company’s name, or the key phrases that are important to your business? How much of your day is spent checking on where your competitors are showing up in those search results? Too much time is the likely answer to both of those questions. Not that you shouldn’t be doing these things, but as business owners and marketing executives, your time is too valuable to spend it trying to gauge your online presence. There are a lot of great tools that will help you monitor your online reputation. Online Reputation Management (ORM) is not only a buzzword in online marketing today, it is vital to the success of your business. But before focusing efforts into how you want to represent your company it’s a good idea to see what is out there on the internet about your business. I recommend using a great tool from Google to get started. For a few years marketing professionals have tapped into a resource that Google provides to its users, Google Alerts. This free service from Google will email you the latest results from within the Googlesphere (Blogs, Web, News, etc.) These alerts can be emailed to any address, however to set up multiple it’s best to log into the service with your Google account, which can be your Gmail. 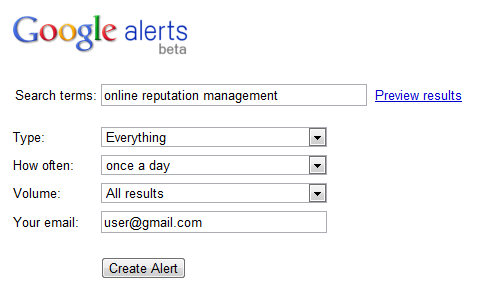 Within a few minutes you can easily set up your first Google Alert. Enter the term or phrase you want Google to track. Using Google’s Advanced Operators will help you track more accurately. Pick the Source of the result. Google defaults to “Everything,” but if you only want to search “Blogs” then you can set up the alert to only check blogs. Decide if you want Google to filter out the best results or if you want every result they find. Select the frequency of reporting. This can be modified later if you wish. If you are logged into your Google account you have the option of having the alert Emailed or it can be viewed in your Google Reader RSS feed. Logging into your Google account will allow you to modify all the options on all of the alerts you set up and you won’t need to confirm each one via email. Set up as many of these alerts as you like, since the limit right now is 1000 per Google Account. I recommend setting the alerts up in groups to track all aspects of your business. Start out tracking terms on the widest area available. The more data you collect the easier it will be to scale the tracking down. The screenshot below shows some generic ideas that will help you get a better feel for managing multiple alerts. 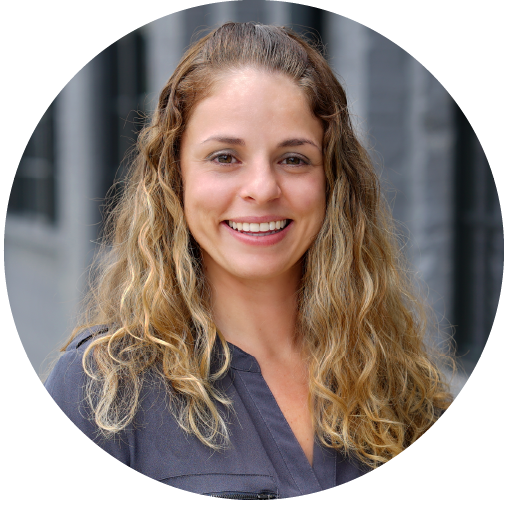 Save Time- Spending a few minutes setting up Google Alerts will ultimately save you and your marketing team time by allowing them to review the emails or RSS feed when it is convenient. Keep an Eye on Competitors -Google Alerts are also a fantastic way to keep track of your competition. Instead of waiting for industry news or press releases be alerted when the buzz around a common product or idea is heating up. Variations of Company Name- Do you have a commonly misspelled company name or product? Set up an alert for the misspelling as well to see how they perform. Take Advantage of Google’s Advanced Search Operators- Almost any query modifications you type into the search box can be set up as alerts. Check out Google’s advanced Search Help section for more info. Using a free tool such as Google Alerts is great way to gain back your valuable time without losing touch with how your company is viewed online. The alerts will catch enough of the new sources mentioning your company that it’s a great way to start the process of building quality Online Reputation Management.